First off, the Council staff reviewed the Hearing Examiner’s decision, which affirmed the Final Environmental Impact Statement (FEIS) except for the section on the impact on historic resources. City staff are already hard at work on the additional analysis to that section that the Hearing Examiner required; they expect to have it complete by the middle of January. Staff also noted that the decision contained an error: it misstated the rules for further appeals in saying that appeals must be filed within 21 days of the decision. The City Attorney’s Office has subsequently filed a motion asking the Hearing Examiner to issue a correction, pointing out that an “administrative appeal” of an FEIS cannot be directly appealed further up the line; only a decision or action based on the FEIS (such as the City Council passing the MHA legislation) can be appealed, though the grounds for an appeal can be faults with the Hearing Examiner’s decision. An appellant can file such an appeal within 21 days of any decision or action that the Council takes (which is still months away). But that also means that there are no immediate procedural barriers to the Council advancing the MHA legislation. final Council approval of the MHA legislation by the end of March. 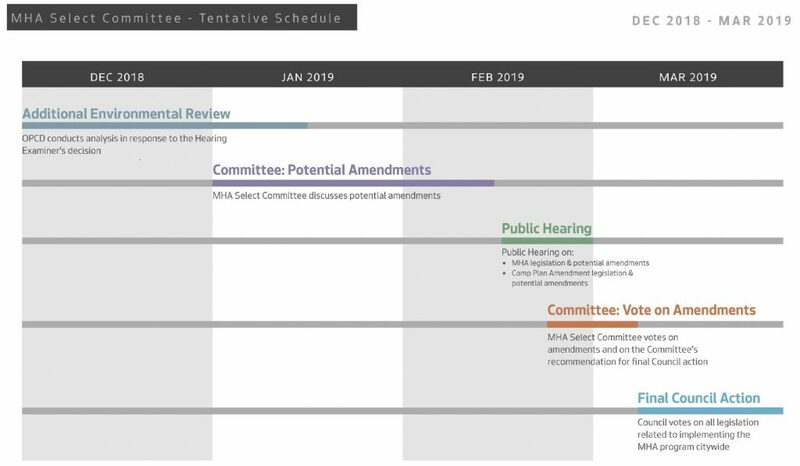 When the Council passed one-off MHA ordinances for the University District, Uptown, and a few other neighborhoods, its custom was to write a companion resolution to codify commitments that it was making to the neighborhoods to address their concerns. The Council expressed their desire to continue that practice with the citywide MHA legislation, though there was some debate as to whether to write a separate resolution for each Council district (or urban village), or to have one catch-all resolution with separate sections for each district and an additional section for issues that cross district boundaries. Council member Johnson, who chairs the MHA committee, indicated his strong desire for the latter approach. changes to the standards in the land use code. In either case, amendments must remain within the scope of the FEIS, otherwise it would require further analysis and revision to the FEIS before the MHA legislation could be passed. Johnson asked his colleagues on the Council to submit any potential amendments in the next 4-5 weeks so they can be reviewed and published to the public in advance of committee deliberations. While there are multiple causes of displacement including an influx of higher-earning households, there is not strong evidence that new housing development is causing displacement, nor is there a correlation between market-rate housing growth and loss of low-income households or between market-rate housing growth and changes in the population of certain racial and ethnic groups. The MHA program is a tool for mitigating displacement only to the extent that more affordable housing units are being built than are being removed. Displacement will continue to happen under all alternatives — including the “no action” alternative where MHA is not implemented. The Council will continue to wrestle with this issue as it deliberates on the MHA legislation. Expect things to get busy in mid January, once the FEIS is revised and finally put to bed.